Sketches List will be taken Saturday morning. So please get there early and get your name on the list. Should you miss the window, please check in as there may be openings as the show goes on. ALL sketches MUST be picked up at the show and payment will be taken in advance. Cash is preferred as the signal in the hall can be spotty. It is time for Long Beach Comic Expo! As the digital-first series continues, a variety of artists will help out, including Jonboy Meyers, Emanuela Lupacchino and cover artist Cat Staggs. This weekend is my first ever Rose City Comic Con! I am looking forward to meeting everyone in Portland and visiting the city for the first time! Also..this is the LAST show of 2015 for me! Catch me if you can! I will have copies of the 35th anniversary print of The Fog! The print is 18 x 24 inches. Original Art will also be available at my table. I will have original art from Wonder Woman 77 on hand! Original art including Oprhan Black, Wonder Woman, Smallville Cover and interior art, Vampire Diaries covers and interior art, Red Sonja, Star Tek and more will be available. Star Trek/ Green Lantern Spectrum War #6 var cov. Happy Holidays and TASTE THE RAINBOW!! It is time for Long Beach Comic Con! This year I will have another very special piece. The Fog 35th Anniversary print signed by myself and John Carpenter. It will be available at the Printed in Blood booth and all sales will benefit the Hero Initiative. The final size of this print is 18 x 24 inches. Original Art will also be available at my table. Hey Kids!! Ill be at both Long Beach Comic Con (Sept 12-13th) and Rose City Comic Con (Sept 19-20). These will be the last shows of the year for me and may be the last place to get a commission until next con season. So if you would like one for yourself or a gift for the holidays, please take a look at the info below. I will be doing some of these on Periscope so please follow me on Twitter/Periscope via @CatStaggs and you could see your commission drawn live! What are you waiting for?! Send that email!!! IDW Orphan Black Comic Book Signing WHEN: 11am – 12pm WHERE: Booth #2743, San Diego Convention Center WHO: Graeme Manson & John Fawcett WHAT: Creators Graeme Manson & John Fawcett will be joined by OB comic book writer Jody Houser and illustrator Cat Staggs for a comic book signing. Click HERE for more info! I will be doing a VERY limited amount of commissions. Will take a short list on Preview Night. If it fills check back on Saturday and Sunday for possible openings. I will have original art from ORPHAN BLACK (cover and interiors), Smallville , Star Wars, and a Limited number of prints. I will be doing a VERY limited amount of commissions. Will take a short list on Friday. If it fills check back on Saturday and Sunday for possible openings. Star Wars Celebration Exclusive Print PRE ORDER! Good Morning! Today is the day we start the pre order sales for the Celebration Anaheim exclusive print, 'Tempest Force". This is the sixth print in the series for me and I am still enjoying these as much as the first one 8 years ago. It is that time again. Con Season is starting. This year will be pretty light for me as we have a new baby in the house on top of my regular workload. This year I'll be starting things off at Long Beach Comic expo on Feb 28-Mar 1. I will have a LOT of original art from Smallville, Vampire Diaries, Star Trek, Star Wars, and ORPHAN BLACK! See everyone in Long beach!! Star Wars Celebration ART SHOW Print Previews! This is where the fun begins! Star Wars Celebration Anaheim is right around the corner! They have officially posted previews to all the prints in this years Art Show! I am excited to be a part of the event and to continue the series that started at Celebration V. The propaganda series that includes "Spirit of '77", "They Were Expendable", "To Hoth And Back", "The Guns of Endor", and the ACME limited release "Encounter At Echo Base". This year we travel back to Endor with the "Tempest Force"
Orphan Black #1—Subscription Variant John Fawcett, Graeme Manson & Jody Houser (w) • Szymon Kudranski (a) • Photo (c) C • 32 pages • $3.99 •Orphan Black co-creators Graeme Manson and John Fawcett expands on the saga with all-new material exclusive to the comic books! •Includes clues and Easter eggs for the highly anticipated third season, coming in April! •Each issue will explore the life of a different clone, starting with Sarah! •Art this issue provided by Szymon Kudranski (Spawn, Detective Comics)! •The first issue includes eight covers, each depicting Sarah with another clone or Felix! •Variant Cover by Nick Runge! Coming in Jan and Feb of 2015 I am doing a two part arc for Star Trek wit IDW. Both covers have been revealed! Don't forget to order your copies next time you get to the comic shop! www.startrek.com/article/first… Star Trek #41: Five-Year Mission -- SPOTLIGHT/"Behemoth, Part 1" (of 2) is written by Mike Johnson, with Cat Staggs providing the art and cover. In the wake of their century-spanning meet-up with Q, the Enterprise crew leaves explored space behind to embark on a new five-year mission of discovery. Beyond the reach of Starfleet communications, they can only rely on each other when faced with their first encounter in uncharted territory, and it could be their last. Roberto Orci, co-producer/co-writer of Star Trek (2009) and Star Trek Into Darkness, oversees this tale. Star Trek #42—Five-Year Mission, a/k/a/ "Behemoth." In the epic finale of the two-part adventure, the Enterprise crew faces an alien threat unlike any they have encountered before... in any timeline. It's a race against time to save the ship... or be stranded in uncharted space. Star Trek (2009)and Star Trek Into Darkness co-writer/co-producer Roberto Orci oversaw the tale, which is written by Mike Johnson and features art and a cover by Cat Staggs. A subscription variant includes a photo cover. Both versions will run 32 pages and cost $3.99. Shipping will depend on where it is going and insurance is required. Should any damage happen in transit please file the appropriate insurance claim. Please note they will be packaged safely and securely. Please send an inquiry to info@catstaggs.com with the subject line "Encounter at Echo Base Print"
As you all know by now, Smallville Season 11 is coming to an end. Right now there are five weeks left digitally and five print issues still to come. As I hit upload for the last time last month, I would be lying if I said I didn't get something in my eye at that exact moment. I have been working on this project for almost three years now and it has been an absolute dream come true. I am going to miss it terribly and I am well aware what a rare opportunity I have had to see it all the way through, what will be, 40 issues. So let me first thank all of you for reading! It has been an absolute pleasure to draw these characters for you. You have been an incredible group of fans and your loyalty to these stories and characters for what will be 125 weeks, has meant so much. I never in a million years thought I would be able to say a book I worked on was a New York Times best seller! You guys did that! As Bryan says, you are all Champions! I must thank the incredible talent behind the scenes Jim Lee; Geoff, Johns; Dan Didio; Hank Kanalz; Mark Chiarello; Jim Chadwick; Sarah, Gaydos; Ben Abernathy; Kwanza Johnson; Kristy Quinn; Jessica Chen; Brandy Phillips. Thank you for believing in my work and for the opportunity to work on such an incredible project! I am forever grateful. To all the artists who contributed to this series! You made this book a visual feast for the eyes! I have enjoyed seeing your interpretations and getting to meet a lot of you on the con circuit. I will be following you and your art on whatever your next project turns out to be. I am a fan! Last but defiantly not least, I want to thank Bryan Q. Miller. It has been a joy to work with him on this project. His love of these characters and this property just transcends. He continued to bring them to life each week, and I , like all of you, was waiting until Friday morning for the next exciting chapter. And, like all of you I have laughed, cried, and gasped my way through his incredible adventures. He has also made 7 year old Cat's dreams come true by giving me the opportunity to officially draw all of my favorite heroes as well as design super suits! (holy tights and capes, Batman! I got to design super suits!) OH and make the Wonder Twins pretty cool! (a purple T-Rex!) And thank you for the chance to draw a Lois Lane story with the best Lois out there! Bryan is a masterful story teller and we are so lucky to get to play in the worlds he creates! It has been an absolute honor. So here we are near the end of a super series! We blew past no flights, no tights right into a league of superheroes! A little treat on the way out the door...Here is the last of my covers for Smallville Season 11! (minus the SPOILERS) How is that for coming full circle?! Well...I think that is it. I must go attend to this leaky eye situation so I can get back to drawing! 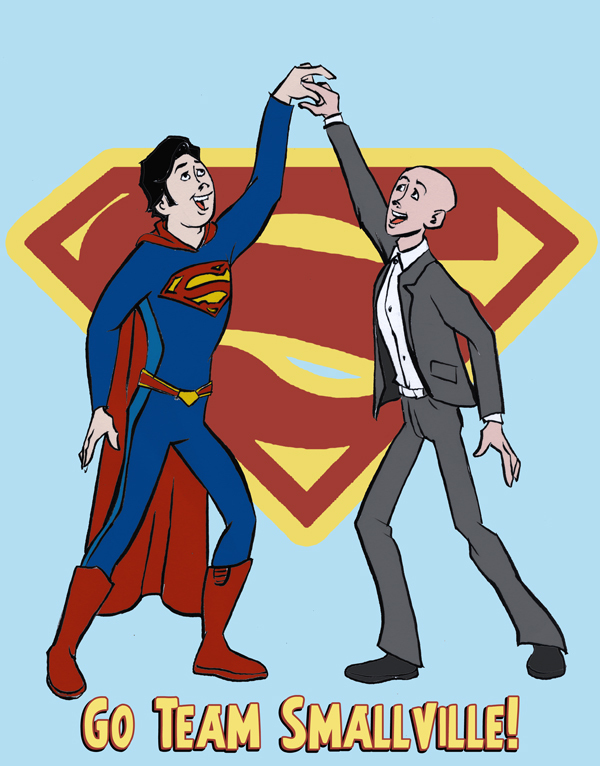 Again, Thank you all from the bottom of my heart for staying with Smallville!